Undercover vice cop JOHNNY FRANCO is a man on the edge. His marriage to the much younger and very attractive FIONA is failing apart, and it's beginning to look as if she may be playing around; ANNE, his 16-year-old daughter (by a previous marriage), is at that troublesome crossover age when a child turns to woman; and he's just killed a man in the line of duty, the second within a month. When Johnny catches Fiona with her lover, it's the last straw, the lover dies and Johnny is imprisoned, charged with murder. But his bitterness turns to anger when he hears that Anne has been dragged down into the sordid life of drugs and prostitution. And his anger turns to revenge. Breaking out, he becomes both the pursued and the pursuer in a savage and breathtaking race to find his daughter and the men behind the racket. But what he finds is dirtier than he could have imagined - more corrupt - more powerful - more deadly. 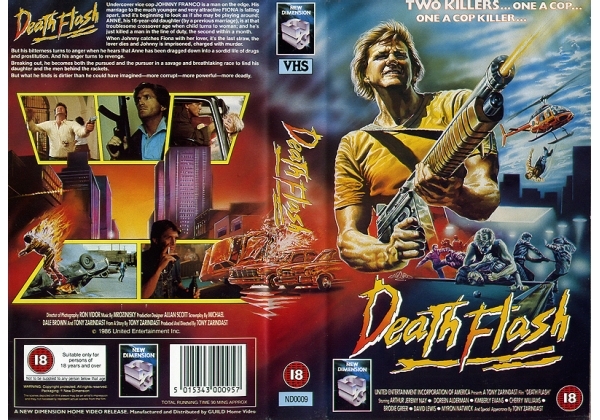 Or find "Death Flash" on VHS and DVD / BluRay at Amazon.